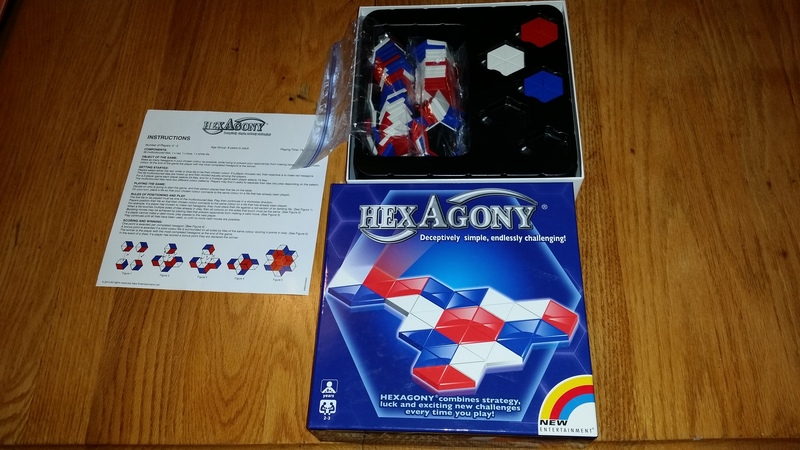 The good folks over at New Entertainment were running a contest a little while back, giving away a copy of their game HexAgony to one lucky winner. As it turns out that winner was me. HexAgony is an abstract tile placement game for 2-3 people and was the winner of the UK Game Expo’s 2015 award for best abstract game. 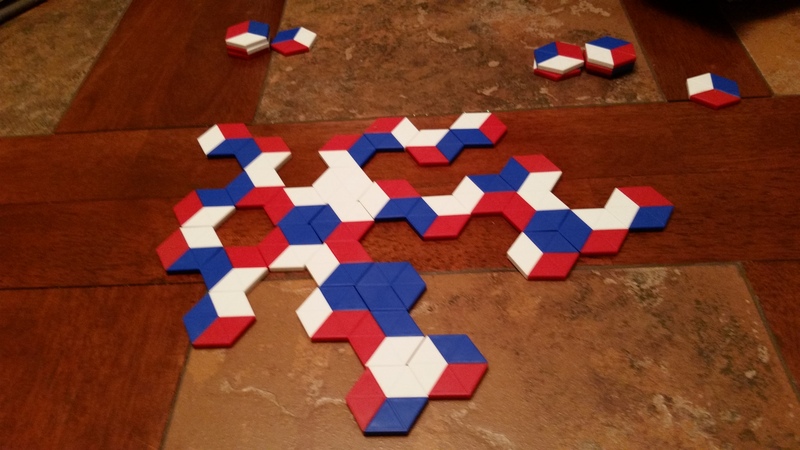 The object of the game is to make hexagons of your chosen color, either red, white or blue. 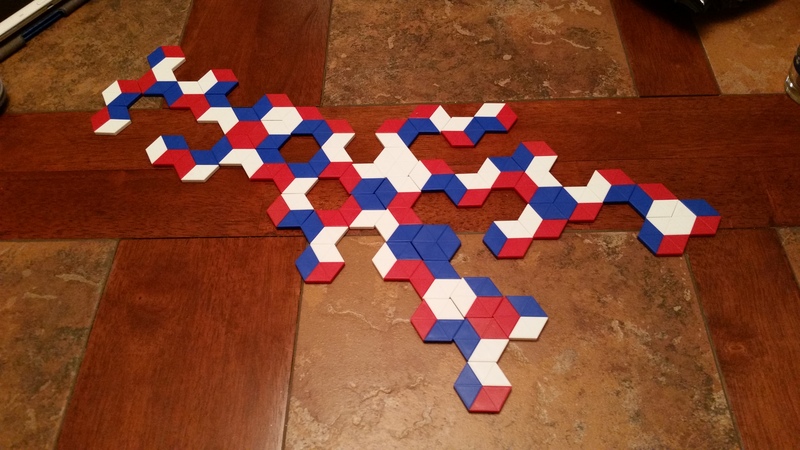 The victor is the player with the most hexagons at the end of the game. Sound simple? Lets find out! 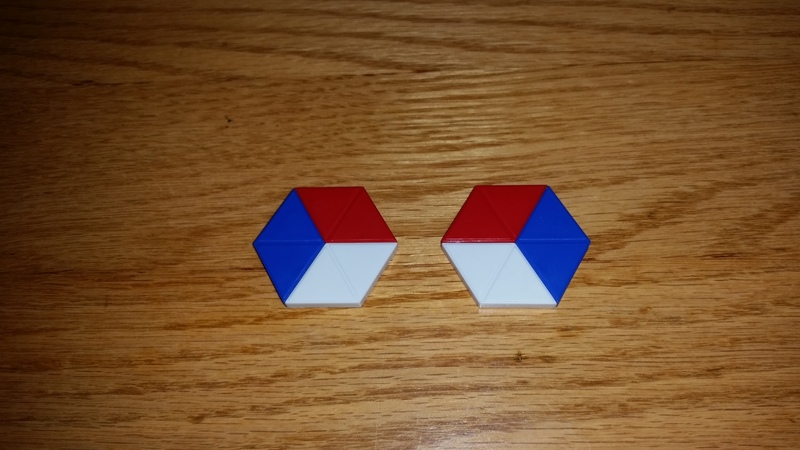 Choose either the red, white or solid blue hexagon. Your goal is to make hexagons of that color. For a 2 player game each person randomly selects 24 tiles and for a 3 player each person gets 16. The tiles have two different patterns. It’s a subtle difference but affects your ability to play tiles on your turn. Once you’ve determined who is going first, the initial tile played must be a multicolored tile. Play continues clockwise. 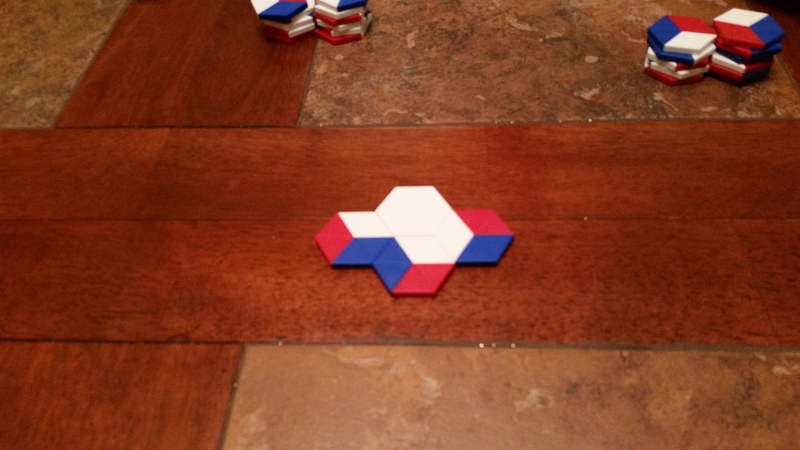 On your turn place your tile so that your chosen color connects to the same color on a tile that has already been played. If no valid move is available then play passes to the next player. Play continues until all tiles have been placed or their are no valid moves left. One point is awarded for every completed hexagon. If you surround your solid colored tile on all sides with your matching color you are awarded one bonus point. In the event of tie then count up all the the half completed hexagons awarding a half point for each. That’s it in a nutshell. The tagline for HexAgony is “Deceptively simple, endlessly challenging” and I have to say that I agree. The concept behind the game is fairly simple, make hexagons of your own color but in practice that may prove more difficult then it sounds. With random distribution of the two different tile types it ensures that each game will be different then the last. This really enhances the replayability for me. Game play lasts for 15 minutes to a half an hour and is ages 8 and up. As I’ve said before a game that lasts under an hour is a real plus for me. The tiles are nicely constructed and durable. The box has a nice glossy finish and looks great sitting on the shelf. The only real “drawback,” and I use that term loosely, is that it’s only a 2-3 player game so you’re not going to pull it out at your next party. Unless of course you have a bunch of different games going on. Sort of like a mini Con at your next dinner party. I like it and I think you will too, so go and check it out and tell them Legends of Tabletop sent you!